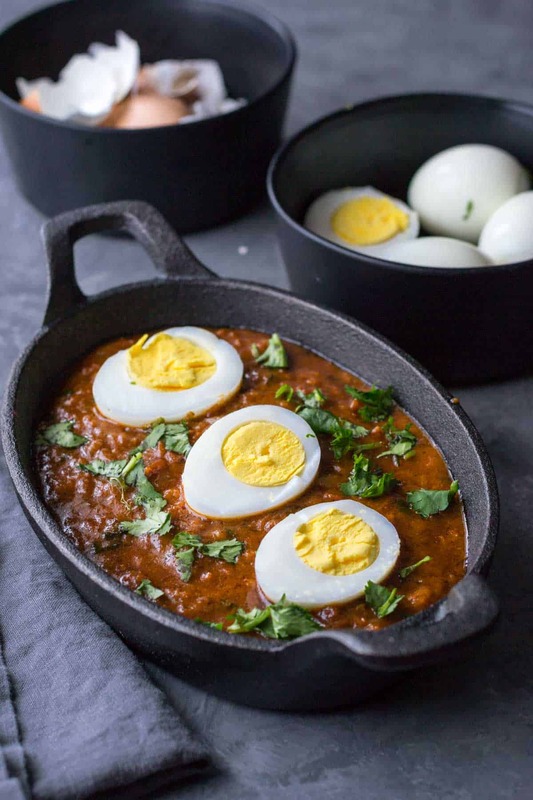 Egg curry recipe – There are so many things that you can do with boiled eggs, but lately, we’ve been into this delicious North-Indian style egg curry recipe that you can quickly make in an Instant Pot or stove top. Pair it with rice or rotis to make a complete meal. Egg curry is typically made by adding boiled eggs to a curry sauce. The base curry could be one of two types – made from coconut milk (South Indian style) or a North-Indian style curry made from onions and tomatoes. I grew up eating the Mangalorean/ South-Indian style egg curry where boiled eggs are added to a coconut milk -tamarind sauce spiced with Kundapur masala powder (a spice blend commonly found in Mangalorean households). When we had unexpected guests at home, my mom would make this curry to get a quick meal together to feed them. While I loved her egg curry recipe, the aromatic and spicy North-Indian Punjabi style egg curry is what caught my fancy. Addition of milk – Instead of cream, a friend of mine adds about 1/4 cup of milk to give this curry a cream touch. Coconut milk – If you like the flavor and creaminess that coconut milk brings out in a dish, you could also add about 1/4 cup of coconut milk. It gives this Punjabi style egg curry a nice South-Indian twist. Skip the whole spices – If you don’t have whole spices, skip it. Let that not keep you from making this curry. Whole spices make any curry aromatic but you can still feel the spice and heat if you use garam masala. 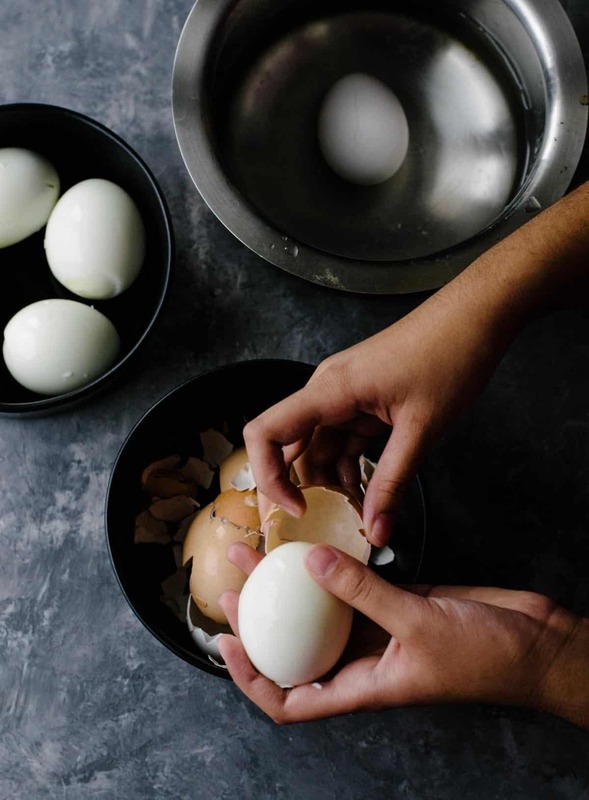 Note – The first step to get a gorgeous looking egg curry is to make perfectly cooked boiled eggs. I strongly recommend you use Instant Pot. Let me warn you, making boiled eggs in Instant Pot can get addictive. I am not kidding. They came out perfect every time and they are so easy to peel that even your kids can do it without denting them :-). Makes you want to make them over and over again just to see how awesome they turn out. So what do you do with all the boiled eggs? How about you try this delicious egg curry recipe! 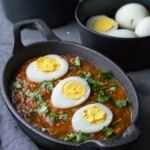 Egg curry recipe - There are so many things that you can do with boiled eggs, but lately, we've been into this delicious North-Indian style egg curry that you can quickly make in an Instant Pot or stove top. Pair it with rice or rotis to make a complete meal. Add garlic, ginger, and onions along with salt. Stir it occasionally till the onions turn soft and translucent (approximately 10- 15 minutes). Add chili, coriander, cumin powder and tomatoes and mix well. Continue frying them till they are soft and mushy, and oil begins to leave the sides of this onion – tomato base. Add milk or coconut milk (if using) and mix well and lower the heat to medium-low. Let it simmer for 2-3 minutes. Gently place the eggs in the pan and cover it with the gravy. Let it simmer for another 5 minutes. Take it off heat and serve hot sprinkled with coriander. Add oil to the steel insert of the Instant Pot and press the Saute function. Press the Adjust button to move the selection to “Normal” and wait till the display reads “Hot.” Add the spices (pepper seeds, cloves, bay leaf, black cardamom, and cinnamon) and let it fry for around 30 seconds and then add garlic, ginger, and onions. Fry the onions till they turn soft and translucent (approximately 10- 15 minutes). Add the tomatoes, chili, coriander and cumin powder and continue frying them till they are soft and mushy, and oil begins to leave the sides of this onion – tomato base. Add milk or coconut milk (if using) and mix well. Hit warm/cancel and press the saute function and press the adjust button to move the selection to “Low”. Let it simmer for 2-3 minutes. Gently place the eggs in the pan and cover it with the gravy. Let it simmer for another 5 minutes. To get that deep red color that you see in the recipe picture, cook the onion-tomato gravy for an additional 10-15 minutes till they turn deep red. Skip the whole spices, if you don't have them. The dish will still be delicious if you are using garam masala. I haven't used coconut milk when I made this egg curry for this post. Adding coconut milk not only makes the curry creamy, it also lightens the color. To get an orangish tinge to your curry, add a teaspoon of turmeric powder along with chili powder. The Instant Pot Shrimp Biryani recipe was fantastic. My Instant Pot has yet to let me down and thanks for this great recipe! If I’m using garam masala instead of the whole spices, how much do I use? Do I still sauté it in the oil? Thanks! Hi, Ashley – You don’t need to add additional garam masala. The teaspoon of garam masala included in the recipe should suffice. I tried this recipe today and my daughter, who doesn’t like onions or tomatoes, LOVED it. In fact, she had it for lunch and volunteered to finish it off for her dinner. The only difficulty I encountered was when I was sautéing all the ingredients and spices. I noticed there was no water in the recipe and towards the end, some of the spices and onions were burnt to the bottom of the insert. I did not add either milk or coconut milk to the gravy but I may next time I try it. Is adding water a good idea or would it ruin the taste of the gravy? If adding water is feasible, how much to add? Coconut milk would be a better option than water. Go for 1/2 cup coconut milk as suggested in the recipe. Sorry, I missed seeing this comment, hence delay in the response. I see that tomatoes are including under the ingredients but I do not see them used in the actual recipe. Are they added after the ginger, garlic and onions are added? Yikes! Sorry Kanan. I fixed it. You add the tomatoes along with the cumin powder and other spices. Thanks for pointing it out!